I am very happy to report that not only is NSS winning, we are winning at an accelerating pace! In 1975, shortly after the L5 Society was created, I attended a major Limits to Growth Conference, as part of a group of L5 leaders. I remember vividly my attempt to explain to a couple of noted professors, after one of the conference’s dinners, that there was a possible solution to the problem of Earth’s limited resources—utilize the vast resources of space. I was a naïve Harvard graduate student at the time, used to being taken seriously in academic arguments. Consequently, it took me at least 10 minutes before I realized that the professors thought I was totally nuts. During the next few months, it became obvious that the opinion of the aerospace community as a whole was even more negative than that of the professors. As I have reported in earlier Ad Astra columns, the world is very different today. Numerous studies and distinguished individuals have made statements that are supportive of our goals, such as former NASA Administrator Michael Griffin; former Presidential Science Advisor John Marburger; and the Augustine report, which is the basis for the current human space program. We are winning. The point I wish to stress is the increase in the rate at which we have been winning during the last year. At an April press conference, the company Planetary Resources announced its plans to mine the asteroids. This is very significant. Planetary Resources enjoys credibility because of the wealth of its financial backers, which include Google CEO Larry Page, the 15th wealthiest American. Eric Anderson, a co-founder of Planetary Resources, stated during his presentation at ISDC 2012 that their purpose is the same as that of NSS. According to its website, “Planetary Resources is establishing a new paradigm…that will bring the solar system into humanity’s sphere of influence.” Sound familiar? Now there are two major thrusts to harvest space resources: materials via asteroid mining, and energy via space-based solar power (SSP). Economically, the two thrusts reinforce one another. Materials mined in space for shipment to Earth can also be used in space to help build SSP satellites. This avoids the high cost of shipping parts from Earth, which potentially reduces the cost of SSP. Not only can SSP be beamed to Earth, it can also be used in space to reduce the cost of asteroid mining. Much of the technology developed for one thrust, such as low-cost space transportation, is also of value to the other thrust. The asteroid mining and SSP thrusts also reinforce one another in the arenas of policy and public opinion. The argument that we can smash the Earth’s limits to growth by utilizing space resources now has two specific examples rather than one. SSP progress has greatly accelerated during the last year. In August the Chinese announced what had only been rumored previously, that they had an SSP program. August marked the completion of the first stage of the Chinese program. A second stage at a substantially higher level of funding has begun. August also marked the first time that SSP has been featured at a major energy (rather than space) conference. The Japanese successfully completed a stage of their SSP program and obtained funding for the first year of their next stage. The plan for this stage results in an SSP demonstration satellite in four years. 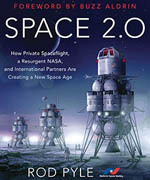 In America for the first time in over a decade, NASA provided funds for SSP research. The contract includes NSS as part of its educational and outreach plan. In the fall the prestigious International Academy of Astronautics released the highly favorable results of their SSP study, the first major international study of SSP. NSS held a press conference to help spread the good news. This led to the establishment in March of the first major international SSP organization, the Global SSP Working Group. Commercial space, strongly advocated for by L5 and NSS since 1975, took a dramatic step forward in May via SpaceX’s first-ever flight by a privately owned company to the space station. The climax of this mission, the berthing with the space station, occurred during the speech of Charles Bolden, the NASA administrator, at ISDC 2012. This was very appropriate, given our history of support. This article was written by Mark Hopkins, Chairman of the Executive Committee of the National Space Society. 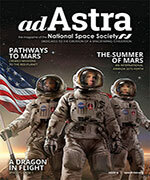 The article originally appeared in Ad Astra, Fall 2012.